We live in a demanding and fast-changing world where we are expected to work at the speed of technology and where constant adaptation can create physical, emotional and intellectual exhaustion. Our life experience and our genetic pre-disposition can contribute to how we respond to the many demands and expectations but, thankfully, we are highly adaptive creatures who can be self-directing and who can become our best selves. We can develop the attitudes, skills and behaviours that maximize our human potential and which can enrich our own lives and the lives of others. At the end of the day, we are essentially emotional creatures who are driven by our emotional and physical needs, passions and perceptions. In an often chaotic world many are on a journey to enhance their essential humanity — seeking a sense of inner harmony, the capacity to bring meaning to our lives and to the lives of others, the ability to create, nurture and enjoy positive relationships at work and in our private lives. This journey is the journey to discover and nurture our emotional intelligence: our EQ. The EQ concept argues that IQ, or conventional intelligence, is too narrow, that there are wider areas of intelligence that dictate and enable how successful we are. Success requires more than IQ (Intelligence Quotient), which has tended to be the traditional measure of intelligence, ignoring essential behavioural and character elements. We’ve all met people who are brilliant in one area but who are socially or relationally inept. And we know that despite possessing a high IQ, success does not automatically follow. Recent advances in neuroscience are adding to our understanding of Emotional Intelligence. Emotions are an important part of being human; emotions cause us to feel, think and act in different ways—to do something or to avoid doing something. Emotions are complex reactions that engage our bodies and minds; they play an important role in how we think, feel and behave. In fact, any one emotion can be made up of thoughts, feelings and behaviours. The behavioural aspects of an emotion are concerned with how you respond to a situation—what you do or don’t do, what actions you do or don’t take. The behavioural aspect of an emotion is the most obvious, observable aspect. These are the physical changes, the internal bodily changes you experience—increased heart rate, feeling queasy for example—when you experience an emotion. When an emotion occurs, particularly a strong basic emotion like fear or anger, chemicals (hormones) secreted by the body’s various glands are activated and spread to other parts of the body. Your body’s muscles, circulatory system, digestive system and organs such as your heart and liver sift from their normal level or function due to the effects of chemical and neural action. Your thoughts—ideas, beliefs and mental images—are also part of an emotion. Emotions are dynamic and one aspect can trigger the other. How you think, feel and act are intrinsically linked. By developing our Emotional Intelligence we can become more productive and successful at what we do and help others to be more productive and successful as well. 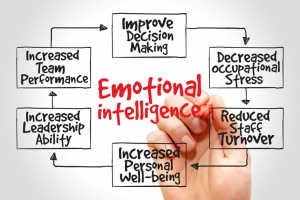 The process and outcomes of Emotional Intelligence development also contain many elements known to reduce stress for individuals while decreasing conflict, improving relationships and understanding, and increasing stability and tolerance. Greater understanding of who we are and how we function can also lessen anxiety and contribute to mental wellness and inner harmony. If you would like to better understand your motivations, values, personality and potential and be more effective in communication with and influencing others, sign up for our Personal Effectiveness Through Emotional Intelligence course in Ottawa. Due to high demand, we recommend registering online as soon as possible, or contact us at 613-234-2020 (ext. 18) or register@pmctraining.com.